Concourse C of the Denver International Airport was re-imagined as a garden oasis within the steel and concrete cathedral-like core of the building. The garden encompasses the entire circulation space where passengers enter and exit the airport train connecting the concourse to the main airport terminal. On the lower level, adjacent to the trains, is a sculpted 7,000 square foot plaza of patterned inlaid granite and copper. Exiting the train one immediately steps upon this patterned plaza and can see hints of the garden above where the sculpted walls emerge from the platforms above the trains. As one travels up the stairs or escalator to the main concourse level the garden slowly emerges as two surrounding stepped gardens bounded by sculpted walls. 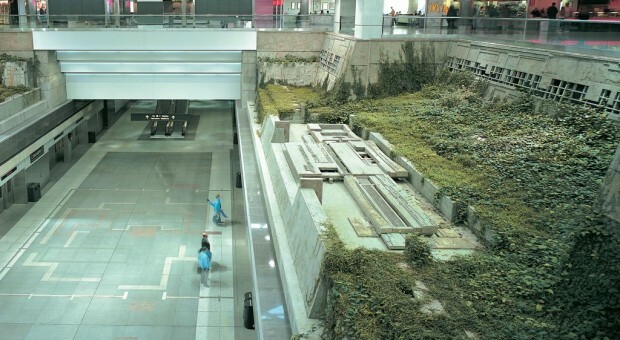 The two facing gardens, each built over the train system below, frame the entire circulation core, creating the experience of ascending into the garden from below or descending into the garden from above (when returning to the main terminal). The design of the garden takes advantage of this unique experiential space with a layering of multiple sculptural levels and details that are sequentially revealed by moving through the building and ultimately understood as a whole by viewing the entire interior garden from above. The two 2,500 square foot gardens are sculpted from stone, wood, concrete panels, stucco, soil and vegetation. The walls of the garden space are fifteen feet high and constructed at an angle, creating the illusion of deep hollow spaces behind the walls. Carefully selected vines climb and weave through the patinated walls and over the ground plane and sculptural elements. A moss garden is placed at the northeast end of the space, in other areas ferns abound. During periods of growth the garden vegetation can overtake the sculptural elements, leaving only traces and glimpses of the complex pieces below, and creating the sense of an archeological ruin. In the original construction irrigation water was allowed to wet the sculptural elements creating small pools of water within the garden, making the interior garden seem as though it were outdoors. This project was restored in 2007 at the request of Denver International Airport. Prior to the restoration Michael Singer Studio received numerous inquires about the gardens expressing concern that the irrigation system had been turned off and the garden was dying. Several individuals, including travelers and people who work in the concourse noted that the gardens were also providing a refuge for birds trapped within the airport. They feared without the garden that the birds might not survive. In part due to these inquires, the waterproofing and irrigation systems were upgraded and the gardens were restored and re-planted.